Pesticides & The Perfect Crime: In the widespread bee die-offs, bees often just vanish. One beekeeper calls it the Perfect Crime—no bodies, no murder weapon, no bees. What's happening to the bees? On a fine June morning two years ago, at a Target store outside Portland, Oregon, customers arrive to a startling sight: the parking lot was covered with a seething mat of bumblebees, some staggering around, most already dead, more raining down from above. The die-off lasted several days. It didn't take long to figure out that the day before a pest-control company had sprayed a powerful insecticide on surrounding Linden trees to protect them from aphids; but nobody warned the bees to stay away. In the end, an estimated 50,000 bumblebees perished. The tragedy at Target wiped out as many as 300 bumblebee colonies of bees no longer available to pollinate nearby trees and flowers. The deadly pesticide is one of a fairly new family known as the neonicotinoids—“neonics” for short—developed a decade or so ago to replace organophosphates and carbamates, which are also highly toxic but dissipate far more quickly. Scores of plants—fruits, vegetables, ornamentals—are sprayed with neonics. The chemical penetrates the leaves and is taken up by the plant’s vascular system, turning the plant poisonous to insects eating the leaves, pollen and nectar. Alternatively, the plant’s seeds are soaked or the soil is treated with the chemical, with the same result. This is convenient for keeping beetles off your roses. It is lethal for bees and other pollinators. And even if it doesn’t kill directly, as happened at the Target lot, sub-lethal doses interfere with the bees’ immune systems and make them vulnerable to pests. They can also damage the bees’ ability to navigate back to the hive. Several of the neonics, incidentally, are made by Bayer, the same Bayer that made the aspirin in your medicine cabinet. Bayer is a German company; yet, since 2013, neonics may not be used on bee-attractive crops in Germany or any other country in the European Union. This prohibition on use in the EU is a manifestation of what’s known as the Precautionary Principle, a fancy way of saying “Look before you leap.” In the United States we do it backwards: Chemicals are deemed innocent until proven guilty, sometimes with disastrous results. She has been domesticated by humans for some thirteen millennia. She is the only creature besides us who manufactures food for humans. She stings only in self-defense. She pollinates a substantial fraction of the plants humans consume. One calculation has it that every third bite of food you eat was pollinated by a bee. The use of ‘she’ here is deliberate. All worker bees are female, as is the queen. The only guys are the drones, a fraction of the total in a hive that has sixty to a hundred thousand individuals. The drones’ only job is to impregnate the queen, which may sound like a cushy gig but he dies in the act. Come fall, the remaining drones are unceremoniously evicted from the hive to save the precious winter resources for the worker bees. Domesticated bees are around two thirds of the total bee population in the world, the rest are wild. Butterflies pollinate too, and other insects, and hummingbirds, even bats in the tropics. In the United States, Europe, and elsewhere domesticated bees are a major player in agriculture. The population of bees, domestic and wild, fluctuates considerably from year to year. Drought will reduce the amount of wild food the bees need to survive. Storms can wipe out colonies. Natural diseases can ravage populations. But bee colonies are resilient and can bounce back from adversity. At least it used to be that way, until the winter/spring of 2006/2007. In that season, the die-off of domesticated bees was so bad bee researchers coined a new phrase: Colony Collapse Disorder. Where the normal annual loss of colonies ran around 10 percent, that year it was over 30 percent, with some beekeepers losing more than 80 percent. And even those stats underestimate reality. Jeff Anderson, a beekeeper in Minnesota and California points out that the official statistics from the federal Department of Agriculture counts only wintertime die-offs, but in the new bee-unfriendly world there are die-offs all year round: Now he loses half or more of his bees in most years. Other beekeepers have similar stories. 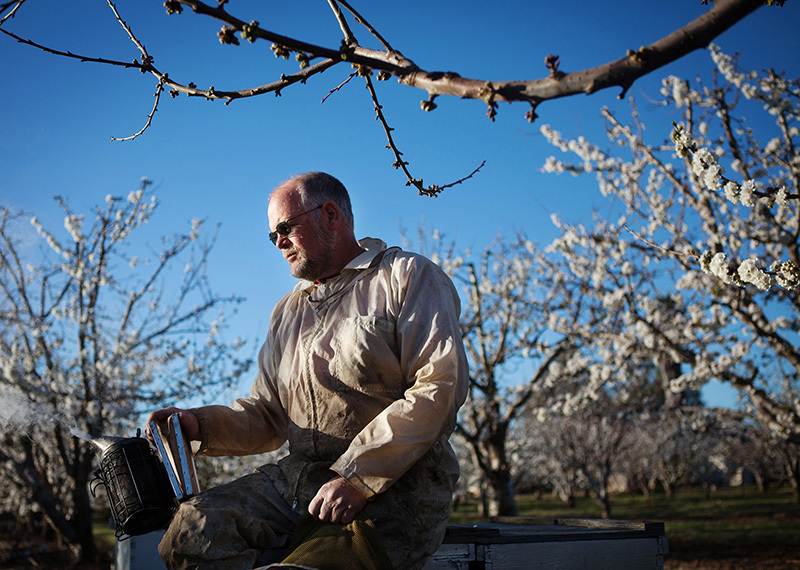 Beekeeper Jeff Anderson takes a quiet moment during the California cherry bloom. And what makes these die-offs different is that frequently the bees just vanish. 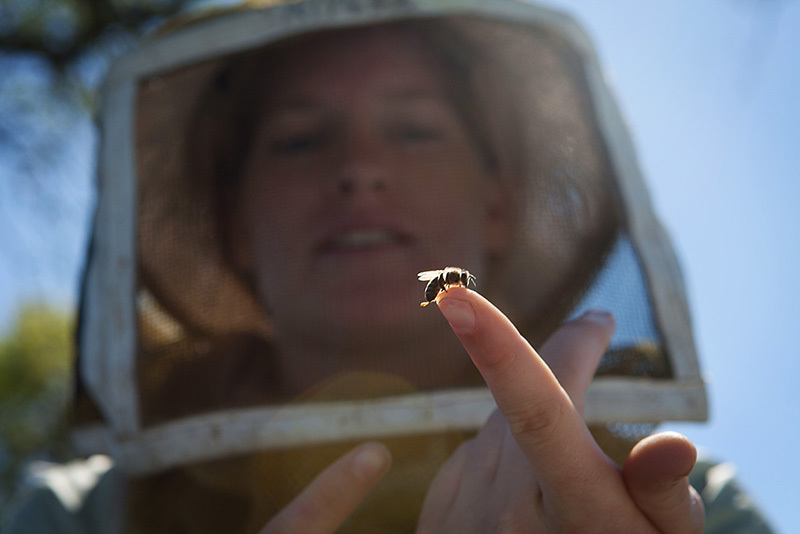 A beekeeper will open a hive to find only brood—developing bees—and a queen, maybe a few drones. The worker bees have disappeared. 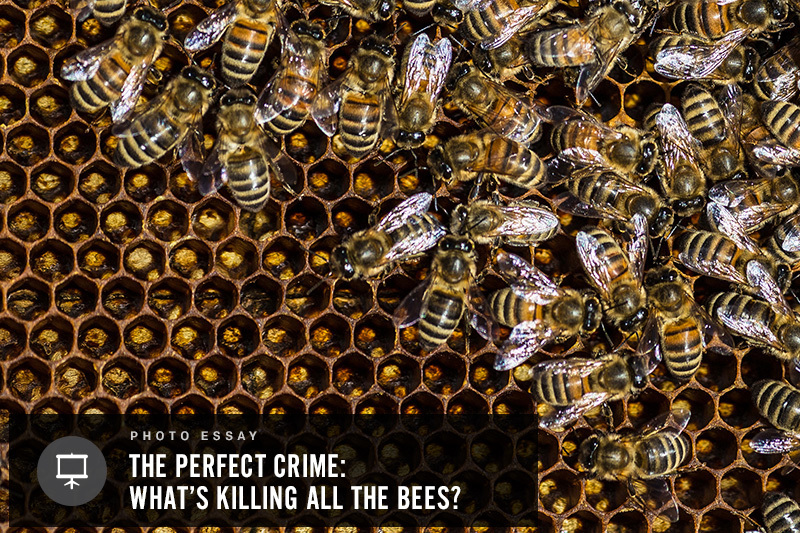 Anderson calls this the Perfect Crime—no bodies, no murder weapon, no bees. One prevailing theory is that a chemical has damaged the bees’ ability to find their way home; they simply get lost, run out of gas and die. Bill Rhodes, a former professional football player turned beekeeper, lives in Umatilla, Florida, where his bees pollinate citrus orchards. In the summers his bees go to North Dakota or Wisconsin to prepare for winter. 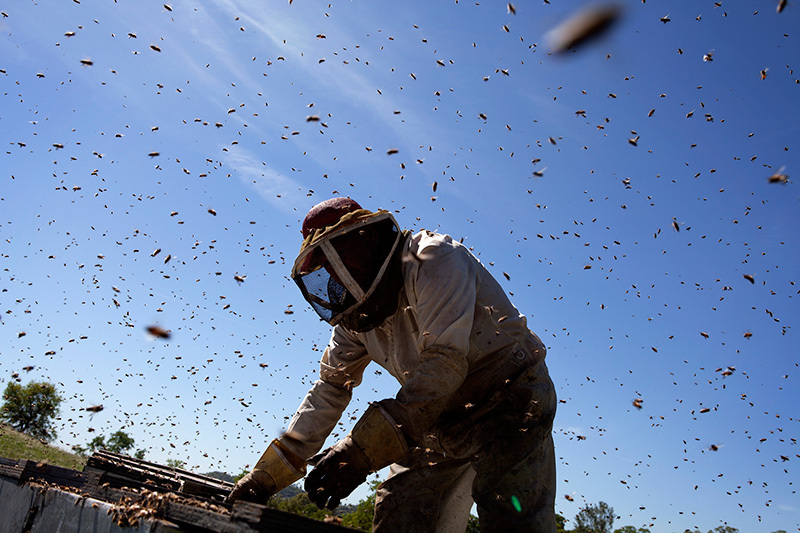 In the spring he trucks his bees to California’s Central Valley where they help pollinate almond orchards. Beekeeping is a huge business—it takes an estimated million and a half hives to pollinate the almonds each year, producing a crop worth $6 billion give or take, twice what California’s wine industry is worth. A major fraction of all commercial bee hives in the U.S. make the journey to the almond orchards every year. Beekeeper Bill Rhodes in a Florida citrus orchard. Rhodes started noticing some problems about 10 years ago. The bees simply weren’t behaving the way they should. At first he thought, he was just a “piss-poor beekeeper,” but soon he knew that wasn’t right. Something had changed in the bees’ lives. 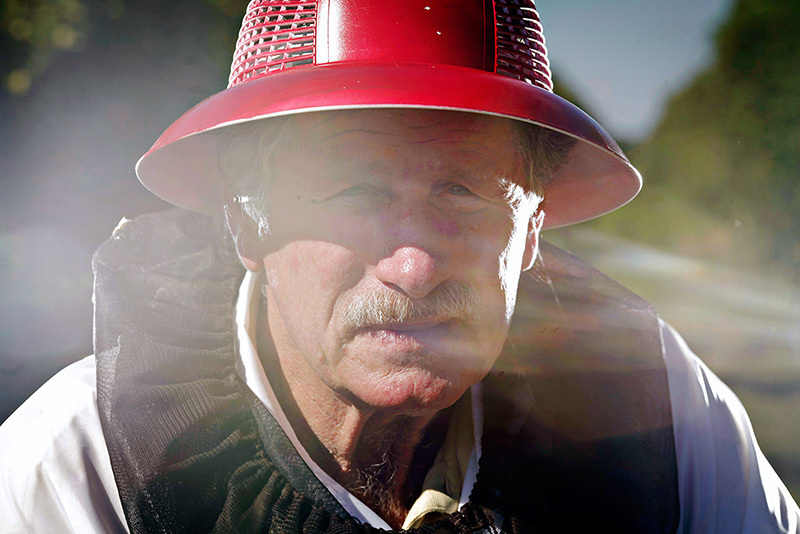 In 2004, he trucked 16 semi-trailer loads of bees to California. “I got paid for two.” The bees just weren’t performing, which was as bad for the orchardists as it was for the beekeepers, not to mention the consumers of almonds. Zac Browning raises bees in Idaho and North Dakota and, like many of his colleagues, trucks them to California in the spring when almond orchards are in bloom. He outlines a phenomenon that has combined with pesticides and other bee hazards to make life extremely difficult: the conversion of bee-friendly areas—or as Browning calls them, “beetopias”—to vast swaths of industrial soybean and corn fields. Both soybean and corn are almost exclusively genetically modified to be resistant to the deluge of pesticides sprayed on the fields to kill weeds. Corn and soy provide very little food for bees even without all the poisons. 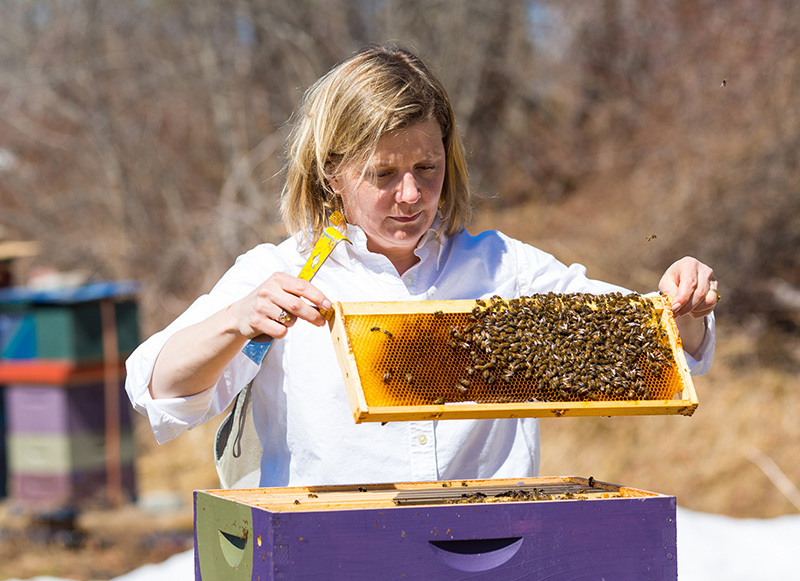 Erin MacGregor-Forbes tends to her bees in Maine. Erin MacGregor-Forbes is an accountant in Portland, Maine, who raises bees for fun and a little profit. She is also a serious student of bee politics and bee science. What worries her most is the fact that many of the plants you buy at Home Depot or another big supplier have been treated with neonics. “Homeowners are planting flowers in their yards thinking they’re helping bees and they’re basically planting poison plants,” MacGregor-Forbes says. The phenomenon holds true for lawns as well: Lawn fertilizers frequently contain weed-killing substances. Bees don’t care about lawns, but the chemical will persist in the soil for three years, so if someone tears out a lawn and plants flowers or vegetables, those will be poisonous to bees. Susan Kegley, a self-described rookie beekeeper, is a PhD chemist and head of the Pesticide Research Institute in Berkeley. 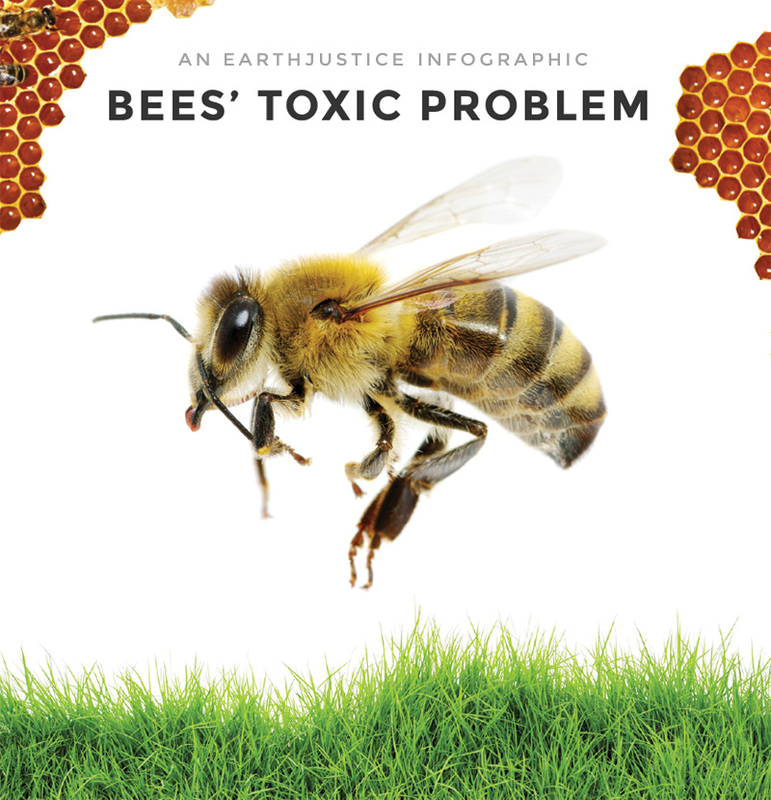 She has dug into data collected by the federal Department of Agriculture and the USGS, and has been helping Earthjustice attorney Greg Loarie as digs into the law surrounding pesticides and bees. Her charts are dramatic and stunning. As pesticide use has soared, honey production has plummeted. Likewise, as massive new plantings of corn and soy have blanketed the upper Midwest, honey production has fallen as bee deaths have climbed. On May 9, 2014, the Harvard School of Public Health released a chilling new study suggesting that even small amounts of neonics can significantly harm honeybee colonies and cause mass wintertime die offs. In the study, the Harvard scientists found that hives of bees exposed to two forms of neonics were much more vulnerable to Colony Collapse Disorder than unexposed hives. “We demonstrated again in this study that neonicotinoids are highly likely to be responsible for triggering CCD in honey bee hives that were healthy prior to the arrival of winter,” said lead study author Chensheng (Alex) Lu of Harvard in a statement. The law known as FIFRA, the Federal Insecticide, Fungicide, and Rodenticide Act, is supposed to protect people, bees, and other wildlife from dangerous chemicals. It has never worked all that well, in part because the companies seeking permission to get chemicals to market are the entities who do the lab tests and field tests of the chemicals, then submit their findings to the EPA for product approval. This is clearly a process with ample opportunity for abuse. Using inadequate science, the EPA approved a neonic made by Dow called “sulfoxaflor” for use on a wide variety of crops in early 2013. Earthjustice, which has been involved in successful efforts to protect people and the environment from dangerous chemicals for nearly 40 years, is currently representing the beekeeping industry in a lawsuit against the EPA for its approval of sulfoxaflor. Case in point: Dow cites an example when sulfoxaflor was used on cotton to kill a new pest called the Tarnished Plant Bug with no reports of bee death. Susan Kegley points out that there were no reports of death because many years earlier, in the early 2000s, a different pesticide had already succeeded in eradicating both weevils and the bees from the cotton belt. Many bees perished, and any beekeeper who wanted to keep his bees alive had already moved them away from cotton. Earthjustice and its beekeeper clients also argue that the EPA’s science doesn’t dig deep enough to consider the true effects of neonics on bees. “You can think about bees in two ways. You can think of individual bees or you can think of the colony, the superorganism,” MacGregor-Forbes says. The EPA has only measured the amount of a given poison that will kill an individual bee or many individual bees, but has neglected the overall effect on the colony. Jeff Anderson, the Minnesota-California beekeeper who is a plaintiff on the sulfoxaflor lawsuit, argues that 95 percent of the applications of the neonics are unnecessary and uneconomic. Zac Browning insists that the switch to genetically modified soybeans and corn must be reversed. And there are far more benign pest control strategies. The benefits of getting off the pesticide bandwagon would be enormous: more honey (there’s a worldwide shortage at present), more reliable pollination of fruit and nut trees and vegetables, less chance of harm to humans and a myriad species of wildlife. And less chance that that lovely shrub you planted to help the bees in your neighborhood will actually be a killer of bees and other productive insects. Alyssa Anderson, daughter of beekeeper Jeff Anderson, holds a baby bee. At least one city—Eugene, Oregon—has outlawed the use of the neonics; others could follow. States could step up as well, as Earthjustice is asking California to do. And it’s conceivable that the EPA could do the right thing. The agricultural chemicals industry is extremely powerful and influential, but if Europe can ban neonics, why can’t we? Update: On September 10, 2015, the 9th Circuit Court of Appeals concluded EPA violated federal law when it approved sulfoxaflor without reliable studies regarding the impact the insecticide would have on honeybee colonies. The Court vacated EPA’s approval, meaning that sulfoxaflor may not be used in the U.S. unless, and until, EPA obtains the necessary information regarding impacts to honeybees and re-approves the insecticide in accordance with the law. At the end of the day, the honey bee crisis is a human health crisis. If we can’t save bees, we can kiss goodbye the most nutritious part of the food pyramid. That’s just not an outcome we at Earthjustice are willing to accept. – Greg LoarieEarthjustice staff attorney, on the significance of litigation to protect the health of bees.